Bret Iwan Signed and Numbered Giclée on Canvas: "Kisses for Bravery"
About The Artist: Bret Iwan has loved the legacy and story behind Disney for as long as he can remember, but he never dreamed life would take him where it has: to voice the world´s most recognizable character, and carry on a legacy he has always held in great esteem. Sometimes amazing things happen that are more wonderful than you could ever imagine. After graduating high school in 2000, Bret decided to pursue his love of art in hopes of becoming an animator or possibly a Disney Imagineer. Bret completed his Bachelor of Fine Arts Degree from Ringling College of Art and Design in 2004 and moved to Kansas City to start a successful career at Hallmark Greeting Cards. Just before Bret´s fifth anniversary with Hallmark, he received an email from a college friend and PIXAR animator, explaining that phone auditions were being accepted to become the understudy to the voice of Mickey Mouse. Bret practiced for a few days, called in and recorded his phone audition, and then anxiously waited to hear back. Weeks later, he received a call that would put things in motion. After several auditions, Bret was offered his dream job as the fourth official voice of the beloved character Mickey Mouse, drawn and first voiced by Walt Disney. Bret moved to Los Angeles in September 2009 to start the next chapter of his life. His first recording was Animal Kingdom´s Adventurers Celebration in June 2009. Around that same time, Bret was introduced to Collectors Editions and the Disney Fine Art program by an old college friend from Ringling... none other than Disney Artist Tim Rogerson. 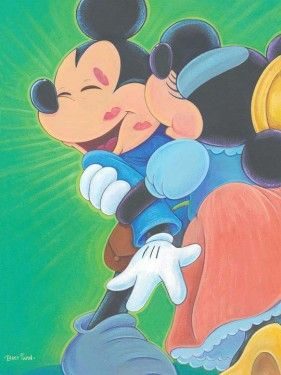 This began a great collaborative relationship between Bret and Disney Fine Art for whom he has created several wonderful portraits of the famous mouse, effectively merging Bret´s life as an artist and illustrator with his new career voicing the most recognizable animated character in the world. Since beginning with Disney, he has met and enjoyed working with the rest of "the gang". Never in a million years would he have guessed that this is where life would take him.